The mayor and speaker at the June 2 announcement of their budget deal. A major disagreement over funding legal counsel in immigration courts was not resolved before the handshake, or after. When families are brought into the court-room at Varick Street Immigration Court, they see their loved ones seated side-by-side on a bench with other detainees, clad in orange jumpsuits, hands shackled. As those detainees are called one by one to have their cases heard, they are seated across the table from an attorney representing the Department of Homeland Security. DHS attorneys will be prepared with documentation and arguments meant to portray the detainee as a flight risk—someone liable to skip further hearings if released—and a danger to society. They will discuss prior convictions, residences, details on family members’ citizenship and criminal history. DHS attorneys can go to great lengths to get detainees to incriminate themselves. In a hearing on June 27, an attorney asked a detainee with a drug charge if he would ever sell marijuana again, even if his family was starving. The man said no, to which the government-backed attorney retorted, “So you’d just let them suffer?” The man’s family, at court, was startled by the line of questioning. Despite the tough odds facing detainees, people facing deportation in New York’s immigration courts did not have publicly funded legal representation before 2013. In the U.S., removal hearings occur in civil rather than criminal court, where federal law does not require court-appointed, government-funded defenders. This creates unique challenges for immigration trials, where defendants often do not have money for a private lawyer, may speak little English, and must navigate complex laws, forms, and requirements. The New York City Council began a pilot program to remedy this in 2013, called the New York Immigrant Family Unity Project. NYIFUP has sought to provide universal representation to those detained in the federal immigration system and facing trial in courts in New York City. The experiment is the first attempt nationwide at a public defender model for immigration hearings. But the program’s universal representation may be short-lived. As of the beginning of the current 2018 fiscal year on July 1, the de Blasio administration seeks to restrict legal funding to those convicted of any of 170 crimes it deems serious. It is the same list of crimes used to determine—along with other preconditions—whether the NYPD or city Correction department will honor a federal “detainer” and hand someone over to federal immigration officers. These restrictions triggered a conflict between the City Council and the mayor in a rare showdown over the adopted budget in May. In a visibly awkward exchange at May’s budget-deal press conference, the mayor and Council speaker gave diametrically opposed answers when asked by a journalist if the funding would remain intact. 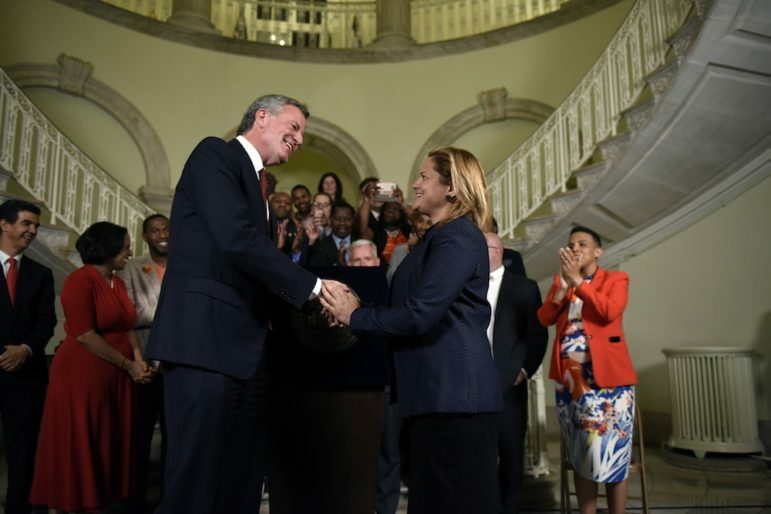 “We’ve put money in to preserve it as is,” Speaker Melissa Mark-Viverito assured the reporter, referring to an additional $10 million in Council discretionary funds intended as a workaround to the mayor’s carve-out. The mayor countered that this money would have to go through a contracting process that he controls. The Council even added an additional term and condition to the adopted budget to direct the funds, but experts who spoke to City Limits say it may not be legally binding. Immigrant rights groups and NYIFUP providers were blindsided by the mayor’s proposed restrictions, only learning about them from City Council staff. What they have learned is cause for grave concern. While the mayor has correctly said the percentage of immigrants who commit those crimes is small, the amount who are in removal hearings as a result of them is disproportionately high, reflecting the way federal law classifies different migrants and the detention practices of federal Immigration and Customs Enforcement. According to data from the Mayor’s Office of Immigrant Affairs (MOIA), 63 new clients between December and May of this year would fall into the carve-out, 20 percent of the 325 new cases taken. The number of those in removal proceedings with convictions often depends on enforcement trends, according to Andrea Sáenz, the NYIFUP director at Brooklyn Defenders. “When ICE is doing more community arrests at home, at work, at probation, you have a higher percentage of people with criminal histories,” she says. Criminal histories are also more likely when ICE is conducting courthouse arrests. ICE arrests in New York State courthouses in the first six months of 2017 are three times higher than for all of 2016, according to Andrew Wachtenheim, an attorney with Immigrant Defense Project, who testified at a June 29 City Council hearing on the issue. The list of 170 crimes is also very broad, advocates say. Crimes on the list range from detonating a biological or chemical weapon to detonating a firecracker indoors. And while the mayor’s carve-out for the legal counsel program is based on existing city laws governing when city cops or jails can turn over a person to ICE, the budget restriction is broader: Only two people were handed over to ICE under the city’s detainer law in 2016, compared to potentially hundreds a year who could fall into the Mayor’s carve-out. Fallout from the budget disagreement is already being felt sharply at Varick Street, where all removal hearings for detained individuals are held, and where a majority of defendants have had a criminal conviction of some kind. As of the week of July 1st, the first of fiscal year 2018, ongoing uncertainty about who will qualify for the program in the new budget cycle has lead to a temporary halting of funds, and the program is not currently taking new clients. Saenz confirmed to City Limits that intake had ceased due to a lack of clarity over funding “We are hopeful that the mayor and City Council will work it out expeditiously and are ready to return as soon as this happens,” Saenz said. On July 5th, one individual in removal proceedings, Mr. Martinez, requested more time from the immigration judge to find a lawyer. The judge noted that she had given the man a list of legal providers in a prior hearing, and as per court procedure asked him to tell the court what attempts he had made to secure representation. The man, who seemed eager to find a lawyer, said he had contacted NYIFUP directly and was told funding was delayed. Judge Tsankov offered him a hearing on July 20, but he requested a date in August, relaying that NYIFUP providers told him funding should come through sometime in July. “I just want to be prepared,” he told the judge, who granted his request. In 2011, the City Council began a two-year study on legal representation of immigrants, looking at New Yorkers who were placed into deportation proceedings over a five-year period. The study found that New Yorkers in removal hearings without legal representation had only a 3 percent chance of succeeding, according to Peter Markowitz of Cardozo’s Immigrant Defense Project, the study’s chair. And only 2 percent of detained New Yorkers during that period were able to secure pro bono council. Those with legal representation were 1000 times more likely to succeed in their cases, according to the Vera Institute of Justice, a partner in NYIFUP. A nationwide study by UCLA looking at data from over 1 million deportation hearings, from 2007-2012 reflects the New York trend, as only 2 percent of people nationwide secured pro bono representation for deportation hearings. The City Council set aside $500,000 in 2013 to establish a year-long pilot version of the New York Immigrant Family Unity Project, followed by $5 million investment in fiscal year 2015. That funding was increased to $6.2 million by fiscal year 2017. The program is operated by three non-profit legal providers: Brooklyn Defenders, Bronx Defenders, and Legal Aid Society. Providers work out of the Varick Street Immigration Court and New York Immigration Court at 26 Federal Plaza, where New York’s two immigration courts are housed. They conduct intake screenings on-site, and seek to provide universal representation. De Blasio based his carve-out on two 2014 city laws that prevented police or correction officials from honoring an ICE detainer and handing over to the feds an undocumented immigrant held at a city precinct or jail. The ban on detainers exempts people convicted of any of a list of 170 crimes from blanket protection under those laws. But the detainer law doesn’t rely only on the list of crimes. Instead, the list, which has been enforced since December 2014, is bundled up with two more preconditions to determine when NYPD will hand someone over to ICE: The person needs to have been released from prison for the qualifying conviction within the last five years, and ICE needs to present a judicial warrant, which they rarely procure. This means the carve-out in the detainer policy is very narrow: From October 2015-September 2016, New York City only honored two detainer requests made by ICE, out of 80 requests made, or a rate of 2.5 percent. From the same period in 2014, before the law was enacted, NYPD honored 196 of 2635 detainer requests, or 7.4 percent. Despite its narrow scope, immigrant advocates disagree with the detainer discretion policy on the principle that it deprives rights to those who’ve already been convicted and have served their time. So when news broke from the mayor’s office that the list of 170 crimes would be used to form a carve-out for immigrant legal defense, many in the immigrant rights community were startled—especially because the new policy would leave a far larger set of immigrants vulnerable. MOIA told City Limits that details were still being worked out, but as of publication, conviction of one of the 170 crimes is the only component of the mayor’s carve-out. Among those carved out by these new restrictions are U.S. citizens who have been wrongfully detained by immigration, former drug addicts who have rehabilitated themselves, and those with legitimate asylum cases who could face torture if deported. Many are now the primary breadwinners for their families and some are pillars of their communities, Markowitz says. The carve-out creates a Catch-22, as many of the convictions that are most problematic for people in removal hearings are the ones that exclude them from legal coverage, advocates say. In written testimony, Saenz of Brooklyn Defenders detailed some served by NYIFUP who would fall into the carve-out, including individuals fleeing torture and people with viable paths to U.S. citizenship. Some hoping to receive NYIFUP representation have not yet applied, fearing they are ineligible. One such person is Ramesh Palaniandi, a legal permanent resident who migrated to the United States from Guyana in 1992. Palaniandi’s wife, Janice, spoke to City Limits about his case, which she has been handling since 2015. She says the couple initially was over the income threshold for NYIFUP and did not apply. But after years of legal debt from battling his deportation, a foreclosure on their Jackson Heights home, and a period of detainment in which her husband could not work, she is now certain they would meet it. Ramesh Palaniandi was charged with attempted burglary in 2007 and sentenced to an 18-month prison sentence. He was released in 2008. In March 2015, he was taken from his home by ICE and ordered removed from the country as a result of the then 8-year old conviction, which the feds considered an aggravated felony. Many aggravated felonies are not felonies at all, but rather misdemeanors handed down by the state but elevated to felonies, under federal immigration law, if they meet certain preconditions. If an immigration judge decides that the crime fits the criteria of an aggravated felony under federal immigration law, a defendant could be subject to an immediate order of deportation. And the decision may hinge on technicalities: a charge of theft is only considered an aggravated felony if the sentence lasts longer than a year, as in Ramesh’s case. Janice is trying to get an appeals court to re-open his criminal case in order to reduce his conviction—for which he has already completed his sentence—to 364 days. “Aggravated felonies are very often not aggravated nor felonies within the criminal law definition,” says Tucker.”You’re virtually assured deportation,” Tucker says of this situation. She says this is why skilled legal representation in immigration court is even more important for those with convictions. “Our case becomes that much more complicated,” she says. Indeed, Ramesh’s case illustrates the importance not just of having counsel, but having very competent representation: Janice says Ramesh was poorly served by one and then another privately hired attorneys. Ramesh says her husband would not be eligible for representation under NYIFUP due to this same conviction, if the carve-out moves forward without any preconditions. Right now, he has a stay of removal, a temporary relief from the deportation process while his case is still pending. But he’ll have to check in with immigration again on May of next year. The mayor’s restrictions could also exclude from the legal counsel program people with drug histories, regardless of any subsequent recovery. Criminal possession of a controlled substance in the first and second degree are on the list of 170 crimes. They are charges intended to round up traffickers but often give criminal records to former addicts. Some of those affected, like Frank Barker, have complicated stories. Barker came to the United States at age 9 as a legal permanent resident, 41 years ago. Despite this, he has dealt for years with removal hearings to deport him to Saint Kitts and Nevis, an island he has not lived in since he was six months old. When he was picked up by police in 2008, the crack cocaine that was discovered on his person was weighed and deemed enough for him to be charged with possession with the intent to sell. Barker was convicted and served a sentence on Rikers Island. But after release, he was picked up at his home by ICE and detained at York County Prison’s immigrant detention facility for another entire year. He received a final order of deportation from an immigration judge, but a letter he wrote to Thomas Decker, the prison’s then field director, lead to his being released on order of supervision on humanitarian grounds. “I was going through a dark period where I went through drugs and alcohol because of the things I was feeling,” Barker says he explained to Decker in the letter about the circumstances surrounding his arrest and conviction. He’s also HIV positive, has an array of medical issues for which he takes 21-23 pills a day, which would be nearly impossible to get if here were deported. Barker volunteers at New Sanctuary Coalition, an immigrant rights group based at Judson Memorial Church. He’s applying for a new work authorization so he can work in non-profits full-time and has been required to check in regularly with ICE for the past six years. He’s hopeful that a pardon application he’s given to the clemency department of the governor’s office can overturn his criminal conviction, so that it’s not considered an aggravated felony. “All I’ve done is go back to being a productive members of society and help others in my situation or worse,” Barker says. He was able to secure some pro bono legal help—a rarity for those in his situation—through networks developed at New Sanctuary Coalition. This is fortunate, because despite his recovery, his conviction would preclude him from NYIFUP representation if the carve-out is implemented. The question of whether carve-outs would exclude reformed felons and addicts was brought up at May’s budget hearing for MOIA. MOIA representatives said that details were still being worked out. There was some confusion, and contradictory reporting in the immediate days after the adopted budget was signed. The day after Mark-Viverito and de Blasio’s press conference exchange, the Council added language to the budget bill requiring that only income will be used to screen clients for NYIFUP funding. The mayor opted to certify the adopted budget with the Speaker’s additional language rather than veto it, likely because legal precedent has shown that the City Council has limited power to change policy through budgetary terms and conditions of the kind the Speaker attached to funding. A power struggle over the budget between the Council and mayor is rare, but not unprecedented. In 1994, when Rudolph Giuliani was mayor and Peter Vallone was the Council Speaker, the Council sued the mayor when he vetoed a Council budget. Sources at the city’s Independent Budget Office say that history demonstrates the mayor’s power over the budget is broad. In the past, the law has interpreted a “term and condition” of the kind that the Council added to the adopted budget—specifying that NYIFUP funds can only be restricted by income level—does not allow the Council to change city policy. The IBO also cautioned that the last test of this kind was over 20 years ago and that many aspects of the city charter are not obeyed to the letter, such as what constitutes a unit of appropriation, so the final interpretation may end up hashed out in court. Providers say they’re eager to have discussions with the mayor’s office about the restrictions on NYIFUP, but so far engagement has been minimal. The mayor has said in interviews that his views on NYIFUP restrictions have not changed, but has also referred to ongoing negotiations, a sign he may opt for a smaller list of restrictions as a compromise. Complicating funding issues further is the fact that the mayor’s office proposed stricter residency requirements after learning many NYIFUP clients are not NYC residents, despite being assigned to immigration court at Varick Street and 26 Federal Plaza. During a period between December and May, 44 percent of new NYIFUP clients were out-of-state residents, according to data from MOIA gathered in the course of exploring the criminal carve-out. Of the four correctional facilities from which detainees in removal proceedings are brought to Varick, three are in New Jersey. When asked about the residency issues, a spokesperson from the Legal Aid Society did not comment on specifics but said they would like to see the program continue with universal representation. Saenz, in written City Council testimony, argued that many of these same immigrants have immediate family members in New York and work in the city. “Our city benefits significantly from the labor and investment of the millions of people who come to our city every day to work,” she said. The Mayor and MOIA have repeatedly said the restrictions reflect limited funding and respect for taxpayer’s values. But at May’s budget hearing, Commissioner Agarwal was asked point-blank by Julissa Ferreras-Copeland if the mayor’s office had received a single complaint from a taxpayer regarding the use of funds on NYIFUP. Agarwal had no answer, instead deferring to a separate talking point. Some critics believe the mayor wishes to be seen as tough on crime in an election year. Rory Lancman, a Queens Councilmember, has been critical of the mayor’s support of both broken windows policing and the carve-outs in the city’s immigration policy. Speaking to City Limits after a panel discussion on criminal justice and immigration at NYU in May, Lancman explained why he thinks the mayor supports the carve-outs. “In his heart of hearts, we know, he doesn’t believe in it,” Lancman said of both broken windows and the immigration carve-outs. “He’s afraid of being perceived as being soft on crime. That’s why, whenever he is challenged on his immigration policy, he immediately jumps to the, ‘Hey, there’s 170 offenses that we can deport people for, that we’ll cooperate with ICE on,’ so this is just another example of him trying to triangulate and cover his right flank,” Lancman continued. De Blasio has said in interviews that he is very aware of that right flank. In the June 9 episode of his weekly “Ask the Mayor” with Brian Lehrer, the mayor was asked whether it was safe to say his most vocal opponents were to his left. The mayor disagreed with the premise, saying he had plenty of criticism from the right. One such critic is Nicole Maliotakis, a Republican mayoral contender who has strongly disagreed with New York’s sanctuary city policies. But immigrant rights leaders, some of whom supported de Blasio in his 2013 mayoral bid, feel betrayed by the stance he’s taken on NYIFUP. Ravi Ragbir, a co-founder of the New Sanctuary coalition, where Frank Barker has been involved, spoke out against the mayor’s plan at a City Hall rally that preceded the budget hearing. Ragbir, who himself has battled deportation proceedings, says he was courted by the mayor in 2013 for support. Ragbir says the mayor seemed happy to have his support at the time, despite Ragbir’s own criminal record. “He was very happy to have me,” Ragbir said. He called on the mayor to continue NYIFUP without preconditions. Numerous wrongful convictions like Michael Morton’s taught Texas that it was time for a significant change to the old ‘business as usual’ approach to criminal discovery. What might that teach New York? Riaz Talukder has two sons, a wife battling cancer and more than one potential route to become a legal permanent resident. But after years of ICE check-ins, he’s been told to come to the next one ready to return to Bangladesh. What do you do if you’re stopped by the police? What should be in your emergency plan? What do you do when ICE picks up your brother, mother … or you?